Launched back in 2012, the Miami Club Casino is currently a gaming masterpiece and a top online casino in the United States as well as throughout the gambling world. Being powered by WGS Technology software provides both a speedy and smooth gambling experience which plays and loads rather well. The full list of WGS games are offered at only four casinos and Miami Club Casino is one of them. Owned by Deckmedia N.V., this casino offers a tremendous selection of games including over 140 slots. Also offered at Miami Club are Table Games including craps, blackjack, roulette, poker, and baccarat. For those who enjoy poker they offer single hand, multi hand and 100 hand games. You most likely will enjoy one of their specialty games including Keno, Poker Slots, Bingo Bucks, Poker Dice and Dazzling Dice. The Miami Club Casino offers an out of the ordinary virtual gambling experience with its marvelous variety of totally downloadable, instant-play and mobile accessible games. The cartoon style graphics and smooth animations add to the playful atmosphere of this casino that’s sure to entertain you while you win. Miami Club also offers an exceptional array of promotions, tournaments and bonuses making it one of the best USA online casinos of the industry. 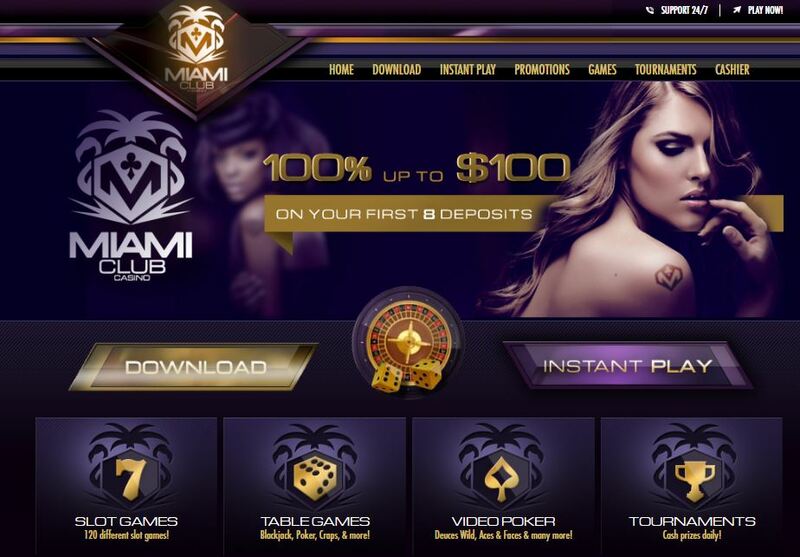 You’ll be thrilled with the promotions available at the Miami Club Online Casino such as the generous Welcome Bonus, the membership to the Miami Club and the Comp Points. • Open an account at Miami Club and you get to claim bonuses amounting to up to $800. By choosing the “Welcome Bonus” option at the cashier when you buy your credits, the bonus will be on the dot added to your account as well as your casino credits as soon as your payment is processed. You can double your enjoyment and double your bankroll. Your loyalty is rewarded by the Miami Club with one of the most competitive industry programs. • Flamingo — You are automatically a Flamingo member and will be given extra rewards and bonuses each month as soon as you make your first deposit at Miami Club.  All deposits receive 20% added bonus up to $200 per day.  Sunday Club – First deposit receives 110% bonus up to $110.  Monday Club – First deposit receives a 75% bonus up to $75.  Tuesday Reloader – All deposits receive a 70% bonus up to $70.  Wednesday Club – First deposit receives a 90% bonus up to $90.  Thursday Reloader – All deposits receive a 75% bonus up to $75.  Friday Super Match – All deposits receive a 100% bonus up to $100.  Saturday Club – All deposits receive an 85% bonus up to $85.  Retroactive 25% Bonus – Qualifying deposits are offered this 25% bonus.  ‘MFLAW’ weekly matching bonus coupon can be redeemed 100% up to $100 each week. • Downtown Member — You automatically become a Downtown Member when you have earned a total of 25,000 comp points. As a Downtown Member, you will receive both extra rewards and bonuses each month. • Bay Front Member — Once you have earned a total of 100,000 comp points, you will automatically become a Bay Front Member. As a Bay Front Member, you will be entitled to extra rewards and bonuses each month with higher maximum amounts than the previous two categories. • South Beach — Once you have earned a total of 250,000 comp points, you will automatically be a member of South Beach. As a South Beach member, you will be qualified to receive extra rewards and bonuses each month with higher maximum amounts than the previous three categories. • Ocean Drive — Once you have earned a total of 500,000 comp points, you will automatically be a member of Ocean Drive. As an Ocean Drive member, you will be entitled to extra rewards and bonuses each month with maximums higher than the four previous categories. • Millionaire’s Row — Once you have earned a grand total of 1,000,000 comp points, you will automatically become a member of Millionaire’s Row. As a member of Millionaire’s Row, you will be entitled to extra rewards and bonuses with higher maximum amounts than all the previous categories. Add to the excitement of playing by pitting your wits against thousands of players throughout the world. Just try the Miami Club Casino Tournaments and play any of your favorite games whether it’s slots, Blackjack or video poker. The Miami Club offers game tournaments daily, weekly and monthly. Simply, go to the casino lobby and click on the link to Tournaments. You will see the games currently offered and can select the game you wish to compete in. Click the ‘Register’ button sign up, and you’re all set to begin.